So. 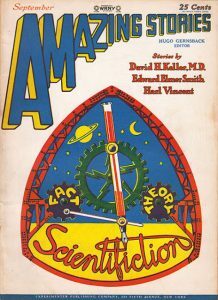 We’re all geeks here, so we probably don’t have to tell you that Amazing Stories was started in 1926 by Hugo Gernsback, giving it the distinction of being the first science fiction magazine. 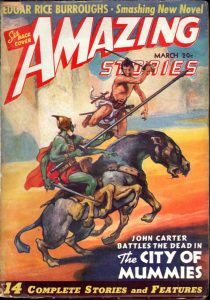 You already know that Amazing Stories published many of the early greats in the field, including Jules Verne, H. G. Wells, E. E. “Doc” Smith and Jack Williamson. But what has Amazing Stories done lately? 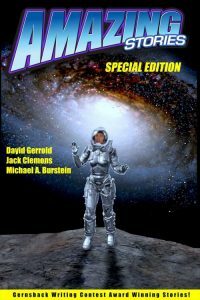 The field of science fiction (or scientifiction as Gernsback liked to call it) has changed substantially in the ninety years since Amazing Stories was first published. For one thing, science has progressed substantially, giving us men on the moon, a map of the human genome, virtual reality, the Internet of things, and real robots and artificial intelligence; never before have science fiction writers had so many toys to play with, and new ones seem to be appearing every day. For another thing, science fiction readers are more sophisticated than they were an almost century ago; they’ve been there and done that with the formulae of the genre, and they’re looking for what’s next. 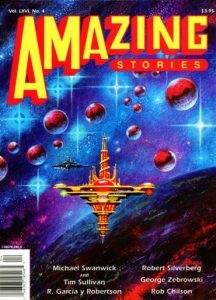 Amazing Stories hopes to be what’s next.